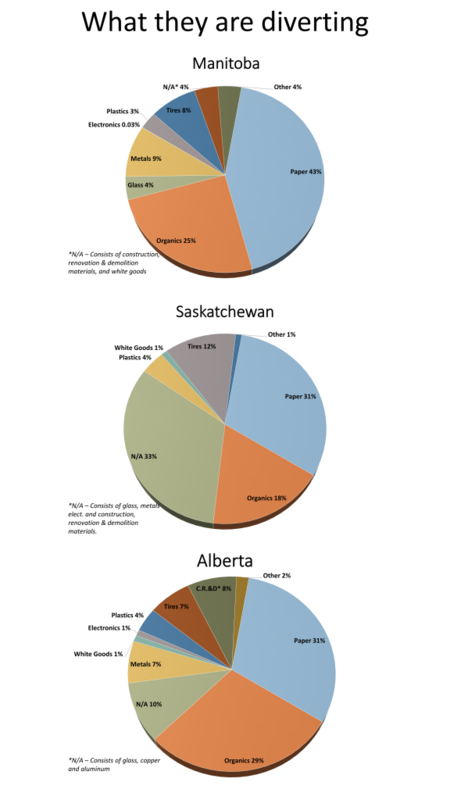 Three provinces lag significantly behind the others in solid waste management in Canada: Manitoba, Saskatchewan, and Alberta. And what’s worse, their low diversion rates (ranging from between 16 and 18%) have not changed much over the last eight years, according to the latest data from Statistics Canada. The data measures the disposal and diversion of industrial, commercial and residential streams of used paper, plastics, glass, metals, textiles, organics, electronics, white goods (such as fridges and appliances) and construction, renovation and demolition (CRD) materials like wood, drywall, doors, windows and wiring. Albertans dumped over a tonne of waste per person in 2016, two and a half times more than the average Nova Scotian and 320 kilograms more than the average Canadian. The three provinces were also among the least effective in waste diversion: Manitobans and Saskatchewanians being the lowest ranked of the eight reporting provinces. As is the case throughout Canada, the major streams of materials diverted here in 2016 were paper and organics, but Manitobans, Saskatchewanians, and Albertans were middle to bottom performers in both. They performed better in recovering used tires: Saskatchewan was tops with Alberta third and Manitoba fourth-ranked per person. Albertans were also number three in the diversion of construction, renovation and demolition waste. But overall, these three provinces have a long way to go to catch up with what’s going on elsewhere in Canada. The pie charts show the major material streams they diverted in 2016. In my next blog in this series I will try and draw all the strands of data together to present a national picture of what the data tells us and outline where the major opportunities for greater diversion seem to lie. The links to the previous blogs can be found here: Canada’s ‘middle performers’ in waste management: Quebec, New Brunswick, and Ontario (March 27, 2019); British Columbians and Nova Scotians are Canada’s best recyclers (March 14, 2019) Canada’s waste diversion rate slowly inches higher (February 28, 2019); Where’s the garbage coming from? More and more from homes (February 19, 2019); Good news and bad news in dumping of waste (October 11, 2018).